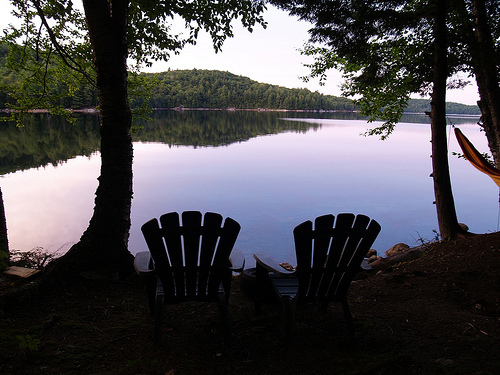 The blog has been quiet on the home front because I’ve been lounging at the cottage. I know, I’m spoiled. And this year especially. We had a full week with only one day of rain, which was really only a misty wet day, which was kind of pretty in its own right. Fall is coming quickly near Haliburton, at Redstone Lake, and I’m looking forward to going up again in a couple weeks when the colours will most certainly be roaring. 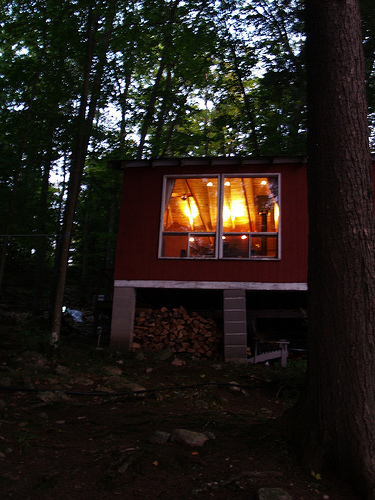 Our cottage is really just a cabin in the woods. Nothing fancy, no hot water, no showers, not even a dock (we hope to rectify this soon, because we also don’t have any sun on our section of shoreline). Bucket-baths are the only option if you need to smell pretty. Otherwise its into the lake with ya. And its a beautiful lake, Redstone, its big, it goes on for miles and has lots of islands and bays. Our bay is called Driftwood Bay, and it lives up to its name. Because the lake is on the Trent-Severin water way, the lake level fluctuates quite a lot, and it will go down by between 6 and 8 feet in depth before the year is over. This year is an exception due to all the rain. By spring the lake is replenished to its high-water level. This makes building a dock challenging, because it needs to float and be able to move with the water height, and if you’re away for a while you don’t want to come back to find your dock all messed up due to a major drop in water level. We found a really interesting new trail near the cottage, off a private road that belongs to neighbors which we thought just simply ended at the last cottage on the west side of the bay. But noooo… it continues. And there are off shoots too. We explored them over a few days… the last time however we ended up way way outside anything we know, and we eventually popped out on Hwy 7, Kenessis Lake Road, and had to hoof it back along the roads to our cottage. It turned into a 3 hour adventure that was way our leagues! But at the same time, it was fantastic. Because of my surgery and other commitments we didn’t get to the cottage for most of July or August, so we’re making up for lost time this fall. More fall colour photos to come! Next Post I have a nephew! Beautiful pictures of the “stone” We’ve been cottaging there 50 years now – on Oshawa Bay. Looks like you might be on Picadilly? HELP!!!!! 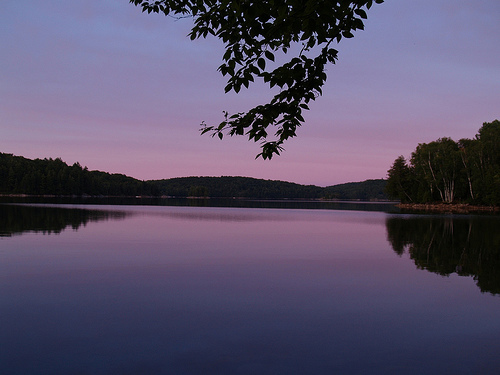 !thinking of buying a cottage in Haliburton. Want to be close to Sir Sams. We have fallen for a place on Redstone, Invader lane….only problem is Im scared…..Redstone seems lovely! The road says it is year round….it seems narrow and a bit steep…do you have any drama in the winter as far as access in? any advise would be apreciated!